Happy Financial Literacy Month! If you haven’t realized already, financial literacy is something I have a lot of passion around. The core reason for starting this blog in the first place was to help others, especially young families, become financially literate. Part of this drive to improve financial literacy comes from my personal experiences. I was clueless about personal finance even after graduating from college with a finance degree. After entering the workforce, I realized how clueless many others were as well about personal finance. The reality is that we live in a world where debt and overspending has become normalized. Normal has become spending your entire paycheck on an upgraded lifestyle. When I realized that money could buy more than a nice house or new car, it was eye opening. Instead of things, money can buy flexibility, less stress, and more freedom. It can allow someone to walk away from a toxic job or relationship. Money can also allow us to give to causes that can literally change the world. Before starting this blog, I had no idea there was an entire community of personal finance bloggers out there. I’m excited to have become involved with this online community. It takes an army of bloggers to let people know that living a life drowning in debt doesn’t have to be the norm. My question to other personal finance bloggers is how often are we getting into our communities to help people? I’m talking about looking people in the eye and understanding the challenges they face when it comes to personal finance. Typing a 2,000 word blog post is great and we all hope that the words we type have an impact. But nothing will ever replace real life interaction with others. Lots of bloggers are great about this already. Many of us are not. Myself included. So how can we take this information offline and directly to the people in our communities? If you’ve tried to have a conversation with someone who isn’t particularly interested in personal finance, then you know it can be challenging. Budgeting, investing, or tax strategy aren’t the most exciting topics. If the information isn’t interesting and relatable, the average person will be quick to roll their eyes with boredom. I believe the key to making personal finance relatable is to show the impact on your everyday life. Financial stability can reduce stress, improve marriages, provide more flexibility in life, and allow you to give generously. Then you can instill the same values within your family. Financial literacy can significantly improve almost all aspects of your life. Below are four organizations you can support that will help you to make a difference in your community today. These organizations have the framework and a proven model in place that directly helps to promote financial literacy. Donating to an organization such as the Plutus Foundation can provide funding for people who are in their communities making a difference. Whether you’re able to give time or money, I hope everyone who reads this takes a step back to think about the impact we’re making in our communities. The Plutus Foundation is a 501(c)3 nonprofit organization that provides grant money that helps create opportunities for the financial media to create, develop, and administer community-based programs that enhance financial literacy, education, and empowerment. Many bloggers and podcasters are familiar with the Plutus Awards, which is an event that is basically the Oscars of the personal finance community. However, the underlying reason for even having the awards is to support the Plutus Foundation. Every project supported by the Plutus Foundation has a set of beneficiaries, and that changes depending on the project. For example, the first ever grant was awarded to Eva Baker, who teaches money management to teenagers in Florida. The Plutus Foundation’s efforts, and your contributions, benefit a diverse array of people of a variety of ages, but the common thread is the need for an understanding of important financial skills. Supporting the Plutus Foundation is a great way to help spread financial literacy in our communities. I hope that you will consider a small donation that the Plutus Foundation can use to fund individual projects in our community. With that being said, not everyone has the financial means to donate to a group such as the Plutus Foundation. Last year I had the honor of participating in the Plutus Foundation’s Giving Tuesday marathon in an effort to raise $10,000 to support financial literacy. The link above provides 14 lessons learned from the event. Many of us may remember participating in a Junior Achievement program in grade school or high school. Junior Achievement’s purpose is to inspire and prepare young people to succeed in a global economy. While their mission is broader than financial literacy, teaching money is an important part of their curriculum. For years, I’ve seen first-hand how Junior Achievement’s content excites children of all ages. Some kids may be excited because they get a break from regular classroom activities. However, sometimes that’s all it takes to plant a seed that will sprout somewhere down the road. When I led Junior Achievement courses a few years ago, it was with second graders. The content was designed to focus on all aspects of a community, with an emphasis on financial literacy. Children had the opportunity to learn about being an entrepreneur, making a profit, paying taxes, and much more. These are all important concepts that help to promote financial literacy in our community. You can visit Junior Achievement to learn more about how you can volunteer your time to get involved in an area near you. Financial Peace University is an interactive 9 week course to help people master budgeting, pay off debt, build wealth, and give generously. While Dave Ramsey can be a bit controversial, it’s hard to argue with his track record of motivating people to get rid of debt. Millions of people have taken his program and many have become debt-free as a result. I don’t support everything Dave teaches or stands for, but overall his course is effective in promoting financial literacy. Last year I had the opportunity to take Financial Peace University and then help co-lead a course. I’ve seen firsthand the impact this class can have on a family. We’ve seen families on the verge of financial collapse turn their lives around. Financial Peace University does a great job of taking complex financial guidance and breaking it down into simple actionable steps. Financial Peace University is part of Ramsey Solutions, which is a for-profit company. Therefore, I wouldn’t suggest a direct donation. However, after leading a Financial Peace University course and seeing the life changing impact it can have on others, you can consider leading a class of your own. Since the course is mostly self-taught through videos you don’t have to be an expert to lead a class. 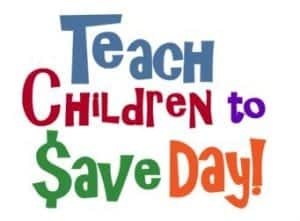 Teach Children to Save (TCTS), sponsored by the American Bankers Association (ABA) Foundation and celebrated annually during Financial Literacy Month, is an opportunity for bankers to demonstrate their commitment to community by teaching young people the value of saving. The purpose is to provide content to young students to encourage them to save money, while promoting the basic concepts of financial literacy. Similar to Junior Achievement, this is accomplished through stories and interactive activities. While volunteer opportunities for TCTS are for individuals in the banking industry, you can play a role in your child’s school to encourage them to support this program. If your child’s school doesn’t teach personal finance this is a great opportunity to expose young children to the basic concepts of saving and investing. I am excited to participate in TCTS later this month to help promote financial literacy. Many of us personal finance bloggers have a goal to help promote financial literacy. While blogging and podcasting is a great way to promote financial literacy, we should also consider getting out from behind the keyboard to directly interact with people in our communities. We all have different causes that we decide to support with our time and money. Giving your time or money can be so powerful. I salute anyone who decides to give to a cause greater than yourself. Consider volunteering for organizations that are out in the community and making an impact to promote financial literacy. The four examples above are just a few of the organizations that are making a difference. A quick google search will turn up a number of other options in your area. Together we can make a difference to ensure that everyone has an understanding of basic financial topics that can have a long lasting impact on our lives. Great article reflecting important priorities. Thank you so much for including the Plutus Foundation among your recommendations! I couldn’t agree more. Blogs and blogging is great, but getting out into the community and talking face to face has a real impact. There are plenty of opportunities. out there, we just need people to jump in. I love your intentions about trying to help others dodge some of the “cluelessness” you experienced in early adulthood. I want to get out from behind my computer as well, so this topic is highly interesting to me. One day a year, we are allowed to teach anything we would like! Kids at our school sign up for classes that intrigue them. I am scouting for resources that could help me make finances look intriguing. I’d like to pack the room and show them the idea of FI just to see their reaction! The Federal Reserve has some great material for teachers for economics and finance. Probably not much specific to FI, but still a lot of great resources. Check it out!